Don't Look Down: What's next? At the end of 2013 and again in 2014 , I mentioned my goals to go sub-2 hours in a half-marathon and go sub-3 hours in an Olympic triathlon. Now that I've met my goal to go sub-6 in the half Ironman I could focus on shorter races. But I have bigger fish to fry. 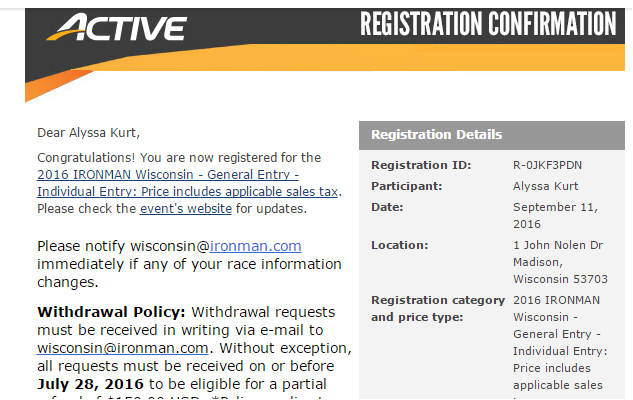 I'm going back to Ironman Wisconsin in 2016. The race experience I had in 2014 was second to none and it is going to be hard to beat. But I'd love to PR and come across that finish line smiling again.